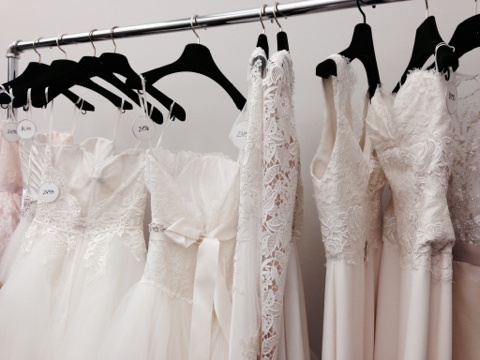 In order to prepare for bridal fashion week, our Bridalistas took the time to research the various new trends floating around the bridal market, to ensure we select the best styles for our brides! We also brought along a collection of photos sent to us from YOU of what you’d love to see us bring home to help us! Among these trends we recognized long lace sleeves, flowy natural waist skirts, different strap options, and unique embellished lace as our top attributes to look for! 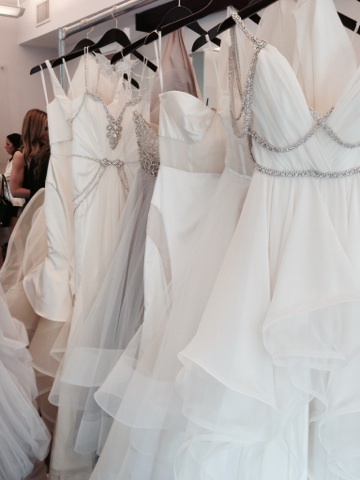 We began our NY bridal fashion week adventures at the JLM Couture studios of Hayley Paige and Tara Keely! Expecting the best of the best, Hayley Paige blew us away with her dazzling details of straps and different options of skirts! The Tara Keely line designed by Lazaro himself, was one we are anxious to show our brides! Beautiful Venise lace sleeves, soft blush tones, and intricately embellished sashes are notorious to Lazaro’s style and romanticism of this collection. It was a fabulous day hosted by the sweet ladies of JLM, and we had a wonderful time meeting the designers!